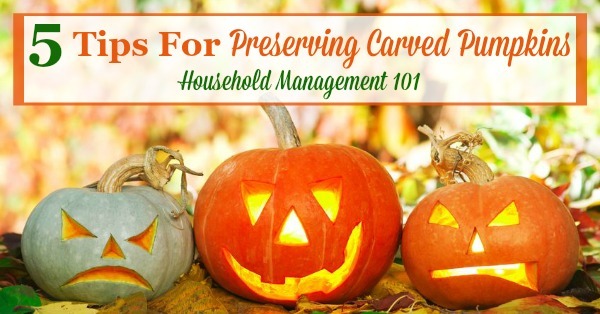 Here are 5 tips for preserving carved pumpkins and Jack-O-Lanterns so you can enjoy them longer during the Halloween season. Carving pumpkins with friends and family, in anticipation of Halloween, or as a celebration of fall, can be a lot of fun. But, those fun holiday Jack-O-Lanterns can turn into a moldy mushy mess in far too short a time if you're not careful, and perhaps not even make it all the way to Halloween night to serve as decoration. 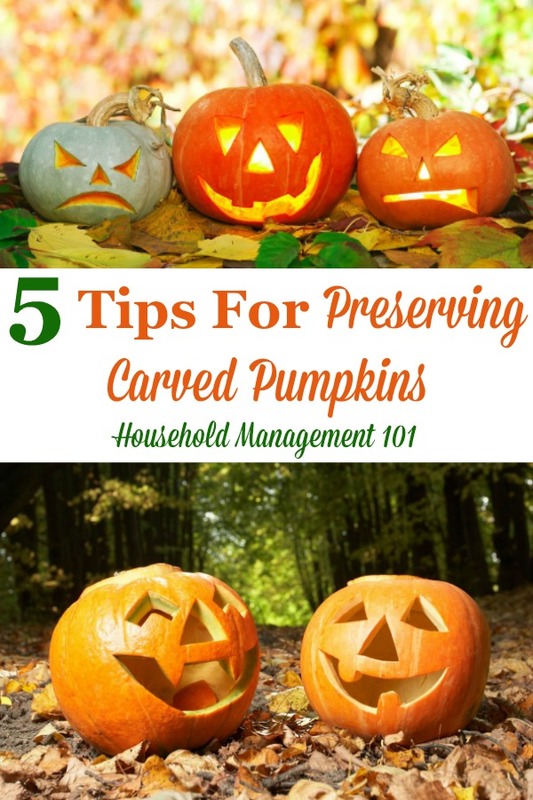 However, these 5 tips are game changers for preserving your carved pumpkins, so you'll no longer be fighting a moldy mess. Obviously though, even with these tips your pumpkin will not last forever, and will eventually have to be thrown away, but these tips will help you keep it pretty and fresh for much longer. Before carving your pumpkin take the time to wipe it down and clean the outside with a light bleach solution. To make this bleach solution add 1 tablespoon of chlorine bleach to a spray bottle that contains 2-3 cups of water. Shake well and then spray on the outside of the pumpkin. Let it dry before you begin carving. This helps because it keeps bacteria and mold spores from outside the pumpkin from being introduced into the interior of the pumpkin as it is carved. Therefore, in addition to cleaning the outside of your pumpkin it's also important to use a clean knife and other pumpkin carving tools, and wipe the tools down as you work so you aren't introducing more bacteria and mold spores into your pumpkin as you carve. The rind of the pumpkin itself is much more durable than the perishable inside pulp. Therefore, when you carve your pumpkin not only should you remove the seeds (but make sure to save them for roasted pumpkin seeds! ), but you should cut out as much pulp as possible. Having less flesh means less to potentially mold and decay. But a word of caution, taking away too much of the inside pumpkin flesh, especially around the carved areas, can weaken the structural walls of your carved pumpkin making it collapse, so be careful! I already suggested wiping down the outside of your pumpkin with a mild bleach solution, but once you've carved it, then it is time to use some more of this bleach spray. Once you've carved your pumpkin spritz both the inside and outside of the pumpkin, making sure to spray all the newly carved edges. Bleach will kill any mold or bacteria that may be present and help extend the life of the pumpkin drastically. This step can be repeated every few days. Allow your pumpkin to dry for at least 20-30 minutes, then drain any excess liquid out of the pumpkin. If you plan to display your pumpkin outside then don't sit it in direct sunlight. The sunlight will both dry it out as well as promote deterioration. Instead, put your Jack-O-Lantern in the shade under the porch awning, or somewhere else shaded. You could even keep the pumpkins in a shaded area until evening and then move them to a more prominent place, such as for display on Halloween night. A hot pumpkin will rot faster than a cool pumpkin. Keeping your Jack-O-Lantern inside in climate controlled temperature is always best if your only goal is longer preservation. If you need it to last longer you may want to create a place in the refrigerator to place it when it is not on display since that will help it stay fresh much longer. Of course, then it can't be seen and enjoyed as much, so as always balance your desire to keep the pumpkin fresh with the fun of displaying your creations from this fun Halloween tradition. 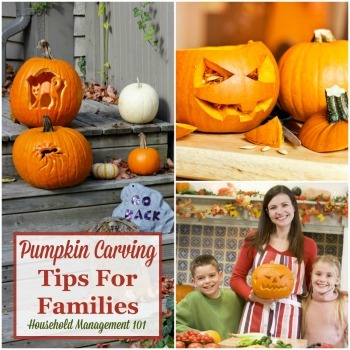 Get more tips for carving pumpkins with kids here!